Life isn’t always easy for network managers and architects. The C-suite is constantly demanding more efficiency and smoother operations, at low cost. Your colleagues are asking for more user-friendly policies and services. And you have to keep up with an ever-changing landscape of technology (infrastructure sprawl) and its ripples into your domain. (Pun absolutely intended.) Uptime and security are everything. Then, you constantly have to explain to people what you actually do for a living. How do you illustrate what you do? Maybe it’d be a lot easier to explain being a fireman, astronaut, or brain surgeon? We've pulled together some helpful GIFs to make this conversation more efficient. If ever there was an indicator that networking has permeated our everyday lives it’s an animated family movie centered around it. Some concepts are so fundamental to modern life that we aren’t even consciously thinking about them anymore. ICYMI: Released in the fall of 2018, Ralph Breaks the Internet provided the subtext and pop culture references we all needed, while depicting basically your everyday. From the moment Ralph and Vanellope slide down the wire, to the hilarious popup advertisers and the wonderfully subtle depiction of DNS — most every aspect of your job comes to life in a tangible, easy-to-explain-to-relatives way, every aspect of the complexities of networking in a network-driven world. DNS isn’t specifically named in the movie, but there are plenty of references. Knowsmore, although depicted as a search engine, certainly has his business rooted (see what we did there?) 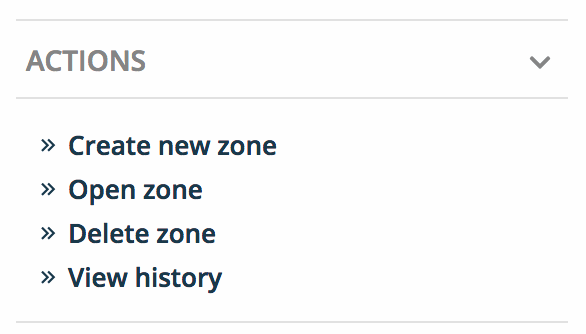 in being a DNS server of sorts. For instance, when Vanellope and Ralph decide to go to Ebay, they were automatically routed to their destination. But if you had to showcase just one thing about your work, it could be how you have to prevent DDoS attacks against your company’s network — essentially how you have to be the hero against a million or billion Ralphs. Explaining DNS to anyone, particularly to people not in networking (and let’s face it, even some people IN networking don’t really get DNS), is easier when you can point to the colorful transport GIFs from an animated movie. Grasping the concept of a botnet or a crippling DDoS attack is more memorable when it’s an ever-replicating bunch of clones of a funny character like Ralph. And you do get malware by clicking unscrupulous links. DDoS is essentially the towering Ralphzilla of mindless objects with a single goal. Exploiting vulnerabilities in web servers, they overwhelm the system with a repeated, single query. Not only is this meant to disrupt user experience, more sinister objectives may be in play, such as bringing down firewalls. 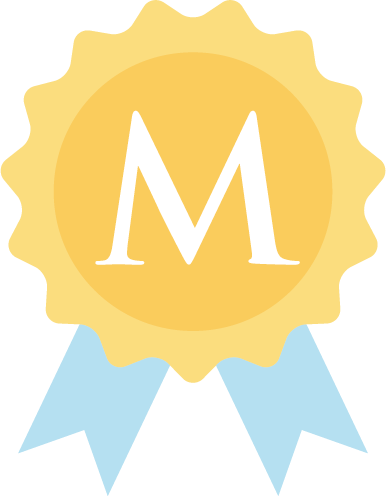 We’ve talked a lot on this blog about DNS education. Education for both professionals — training, if you will — and for everyone, in order to understand new technologies and challenges affecting our businesses. Knowing why and how insecure networks are a liability and how important it is to defend against malicious attacks that can wreck the internet is useful for everyone. The movie exaggerates concepts to either serve the plot or get a laugh. But the foundation for showcasing how networks and the internet work (or occasionally don’t work) is solid. Come this holiday (provided you don’t have to work because of some real-world Ralph threatening your company’s network) sit down at the family dinner, armed with GIFs and your favorite streaming service, to explain what you do and why. And since it is a holiday weekend, here's a blog about all of the Ralph Breaks the Internet Easter Eggs. 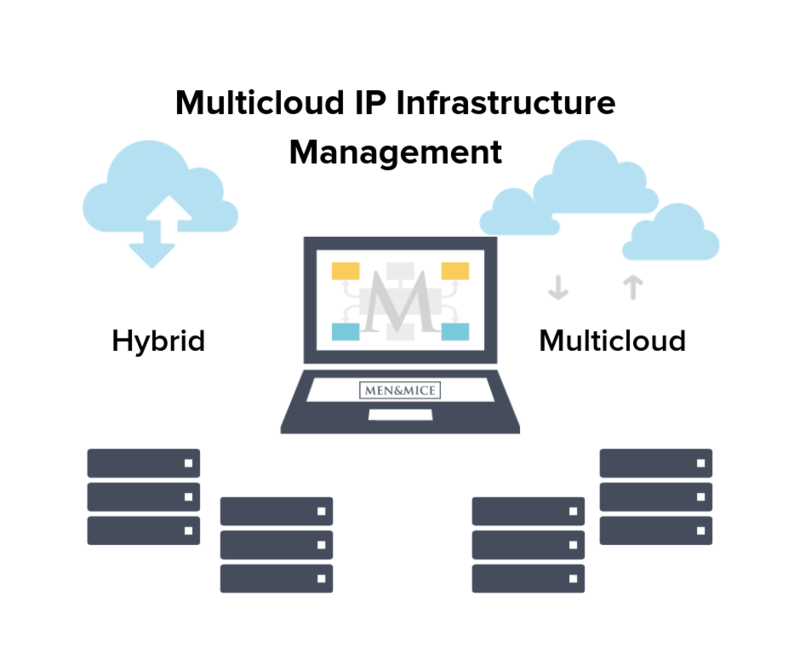 Whether you want to spell it multi cloud (with a space), multi-cloud (with a dash), or just ditch all of that and go full-on conjoined “multicloud”, the fact remains that multicloud utilization is on every business leader’s lips. Whereas before enterprises viewed migration to the cloud as a distant possibility, the focus has now shifted entirely. Increasingly data intensive applications and services require that they speed up their digital transformation, and to stay competitive, explore the benefits of migrating their data, services and applications not only into one cloud, but many clouds. Competing cloud infrastructure offerings, such as AWS and Azure, provide enterprises with undeniable benefits. Network availability, for instance, can more readily be optimized as workloads can be switched between vendors in the event of a localized failure. At the same time, utilizing one, or many clouds, also presents new challenges to network management. How do you maintain multiple networks on multiple cloud platforms, each with their own means and methods of running their cloud environment? Multicloud connectivity is the software-defined, invisible layer of abstraction that takes care of communication between different (and often incompatible) vendors, platforms, and implementations (on-prem, hybrid, private, or public). As digital transformation journeys are becoming more and more streamlined and less and less experimental, it helps network managers to consider the emerging best practices around multicloud connectivity. Organizations can and should take charge of picking services aligned with their cost-benefit vectors. From SaaS applications like Salesforce, Office 365, or Google Drive, to raw computing and storage infrastructure resources, most everything is delivered from the cloud. But that also means more moving parts, which can lead to possible service degradation. Best practice: Cloud vendors aren’t motivated to play nice with each other, so it falls to organizations to plan for and implement multicloud connectivity in their cloud adoption strategy. In the charge to the cloud, there has been a huge focus on security for storage and computing resources. However, there hasn’t been a similar awareness of network vulnerabilities - and with multicloud re-defining networking it’s especially timely to pay attention to security now. Best practice: Beyond smart planning of networking strategies, multicloud connectivity helps to address the challenges posed by threats to network availability. When disaster strikes,, cloud services are well-positioned to keep a business up and running regardless. DDoS attacks or simple human error disrupting everyday operations don’t need to cause a total shutdown of an organization’s network. Building contingencies seem simpler in the multicloud, but disaster recovery can also put an increased strain on the network, particularly if network managers have to struggle with vastly differing operational requirements in different cloud environments. Best practice: With such a critical role to play, networks need to rely on strong, functional connectivity between multiple cloud environments to strengthen them. Multicloud makes connectivity not only crucial but defining. As a company focused on networking solutions, Men & Mice is excited about this unique emphasis on networking itself. 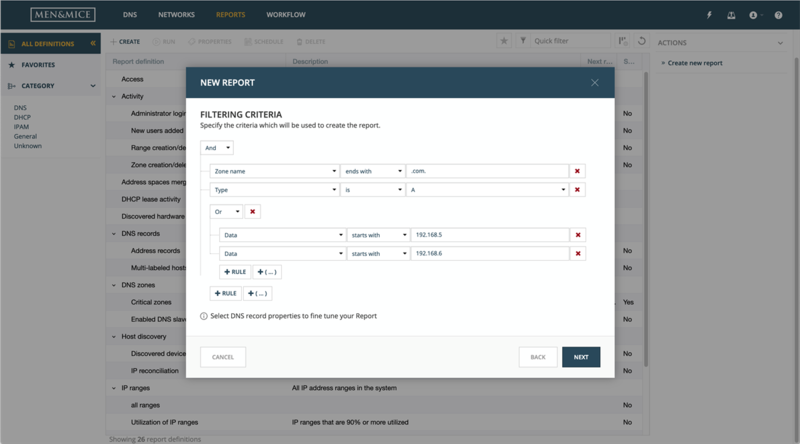 The Men & Mice Suite is a hybrid and multicloud DNS, DHCP, and IP Address Management solution. It’s been built to provide the multicloud connectivity by being widely compatible, secure, and reliable. It’s software-defined. The connectivity layer provided by the Men & Mice Suite depends on no set architecture or infrastructure and requires no single-point-of-failure hardware. It’s compatible. 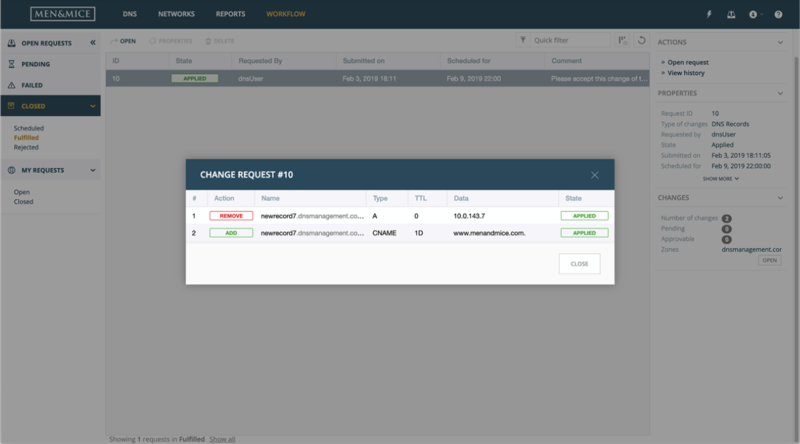 API-driven and backend-agnostic, the Men & Mice Suite simplifies programmatic control and automation across multiple cloud vendors. It’s secure. The Men & Mice Suite extends the enterprise-grade security over the connectivity layer, allowing for audit trails, role-based access controls, and migrating existing security policies to the cloud. It’s fault-tolerant. Customers can rest easier as the fall-out from human error, DDoS attacks and cloud service outages can easily be mitigated by the Men & Mice xDNS Redundancy™ feature. With the upcoming release of version 9.2, the Men & Mice Suite improves on its already best-in-class solution. 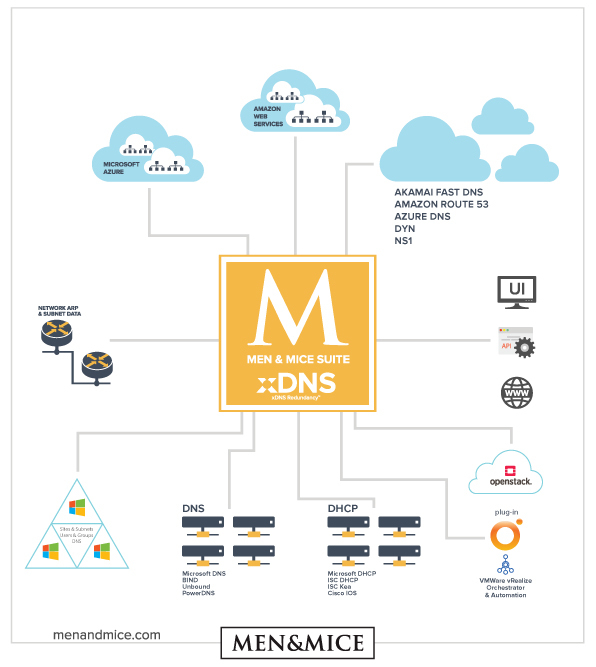 From deep AWS and Azure integration to the flexible web application, developing the Men & Mice xDNS Redundancy™ for added security and reliability, we’ve made multicloud DNS, DHCP, and IP Address Management even better and ready to deliver on the need for connectivity. We’ve previously outlined the Men & Mice Suite’s deep integration with on-prem Windows and cloud-based Azure and Azure DNS, which helps extend the value of Microsoft services investments while gaining comprehensive visibility, management and scalability from the Men & Mice Suite. This is particularly helpful for network environments comprised of either several Microsoft services, including Azure, or hybrid environments where several otherwise non-compatible services need to be utilized. If you’re already dependent on Windows servers on-prem and other Microsoft products to run your infrastructure, moving workloads to Azure makes a lot of sense. As is, many large-scale organizations, from Fortune 100-500-1000 companies, to education and research institutions or governmental municipalities, are already deeply reliant on Microsoft software, as are a good number of Men & Mice customers, many of whom have begun moving workloads into Azure over the last few years. Men & Mice has a long history of technical compatibility with Microsoft products - including being the first vendor to offer Azure DNS third party support. This, combined with our presence in the Azure Marketplace, as well as our burgeoning business relationship through Microsoft’s Co-Sell program, means accessing the benefits of both Azure and Men & Mice has never been simpler. Use of APIs to manage data. Looking for the easiest way to evaluate Men & Mice Suite and Azure? Try the Men & Mice Suite directly from the Azure Marketplace. 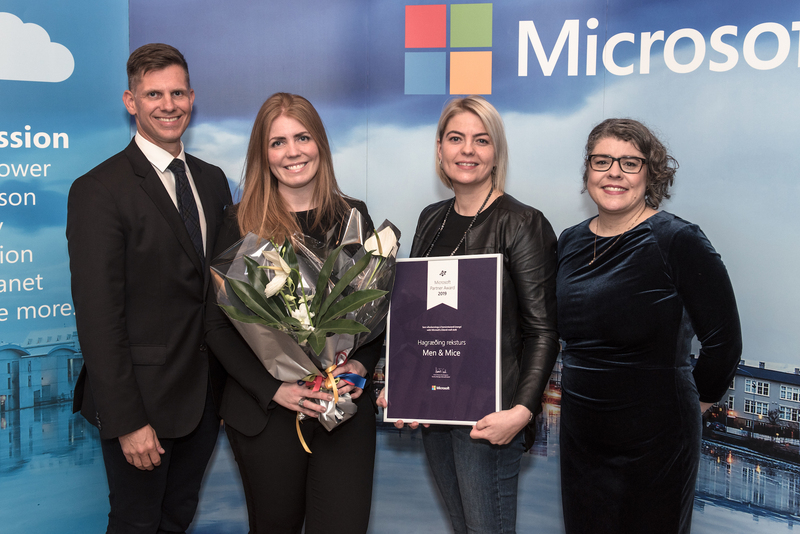 As a Co-Sell partner and a recent winner of the Microsoft Partner Award for Infrastructure Innovation, we’ve further expanded our reach with Microsoft beyond technical capabilities to create new simplified, ease-of-access processes for customers of Azure and Men & Mice Suite. Mergers and acquisitions are made easier by staying in the same ecosystem (Windows Servers + Azure). Likewise, unifying a multitude of on-prem and cloud network services and environments through Men & Mice Suite, eases network transitions and provides near-immediate visibility. Utilizing the Men & Mice Suite with Azure allows the dynamic scaling or migration from on-prem Microsoft DNS or BIND to Azure DNS. Physical expansions are also made easier through using the Men & Mice Suite to clone already working environments, while taking advantage of Azure’s global availability to reduce local latency and support turnaround. Project fragmentation causing network overlaps and conflicts can be quickly resolved through Men & Mice Suite on top of Azure, providing transparency for all IP addresses, VNETS, and subnets. Network diversification. Network supply chain diversity is critical to add redundancy and prevent against DDoS and other malicious attacks. Using the Men & Mice Suite’s xDNS Redundancy™ feature makes this easier, while the infrastructure is backed by Microsoft’s robust SLAs. The Men & Mice Suite’s superior Windows compatibility, Active Directory integration, as well as native support for IP Address Management in Azure and Azure DNS have both attracted Men & Mice customers to Azure as well as, increasingly, Azure customers to Men & Mice Suite. 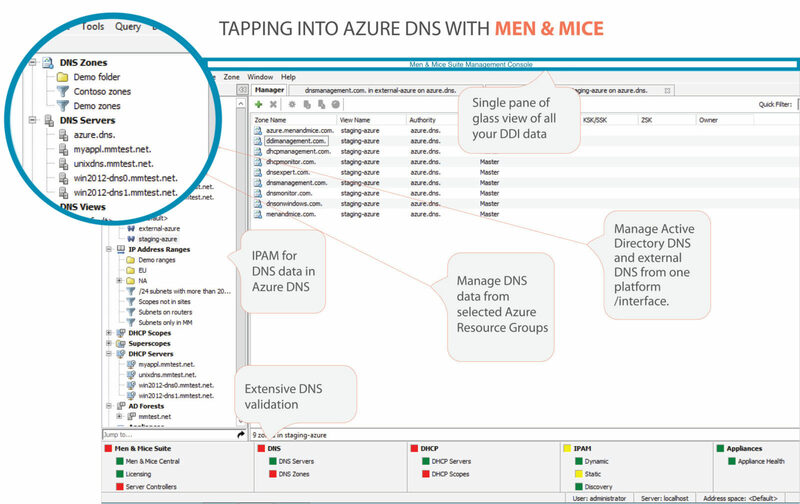 With the Men & Mice Suite you can see VNETs, address blocks, subnets and IP addresses across all of your organization’s Azure infrastructure, and sync between Azure DNS and other DNS platforms using Men & Mice’s xDNS Redundancy™ feature. Or, migrate entire zones to Azure DNS from other services and fully manage them using granular access control tied into Active Directory. 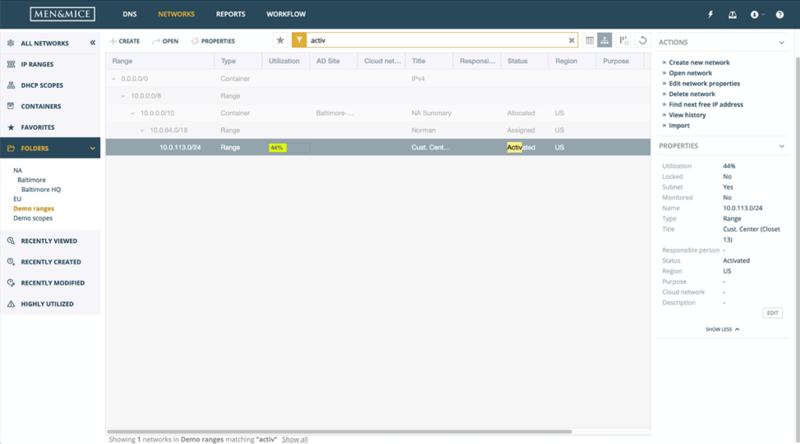 The resilience, scaling, and security of Azure combined with the hybrid and multicloud management and visibility offered through Men & Mice Suite helps to resolve obstacles in the form of runaway migration costs, lack of compatibility between the multitude of on-prem and cloud services and loss of control in managing the DNS in conjunction with the IP data.